Lesson 9 | Where to go next? The word sketch is Sketch Engine’s hallmark feature. It is the easiest way to learn quickly about how a word or phrase behaves. The Word Sketch gathers information from thousands and millions of examples of use and provides a one-page summary of categorised collocations with links to examples serving as an at-a-glance overview of the word’s behaviour. Word Sketch feature might not be available for all corpora. After logging in, first choose a corpus by clicking it. Click (1) Word Sketch , (2) type a lemma (=the basic form of a word, if the word is went, the lemma is go; it can be lowercased for some languages) and (3) click Show word sketch. 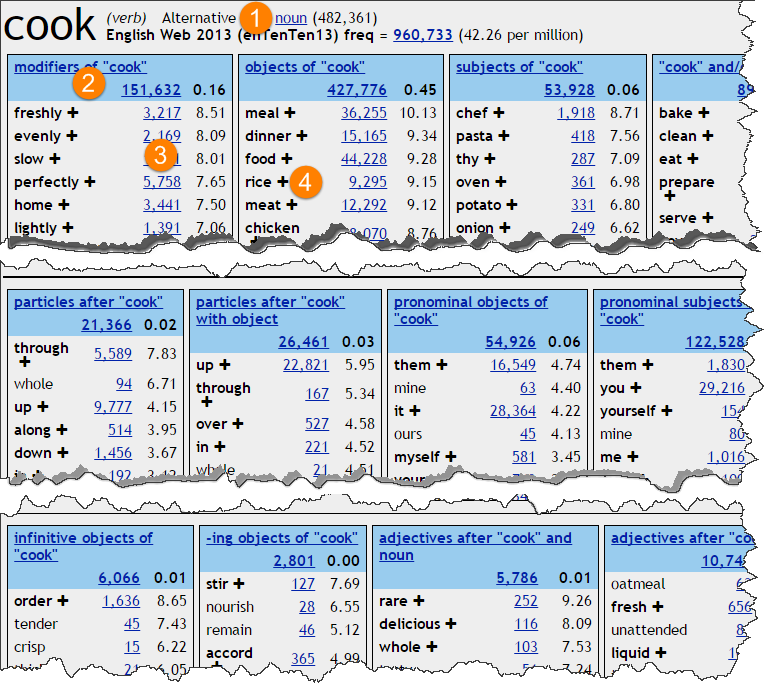 A page with collocations will be generated within seconds: click (1) to see a Word Sketch for a different part of speech, the column headings (2) show the type of relation between the collocates and the search word, if in doubt, click the frequency count (3) to display examples which will make the relation clear. A multi-word sketch is available for the words in bold. Click the plus sign (4) to reveal a new word sketch for ‘cook rice’. To learn more about Word Sketches, please refer to the User manual.